Tell us about you by using the Construction Conversation form OR give us a call at (407) 898-4821 to set an appointment to talk. Expect a phone call within one business day to discuss your needs. Together, we’ll decide the next best steps to advance your agenda. Shifting work space needs are typically a sign of a healthy and dynamic organization. The last thing you want is physical space to limit organizational growth. 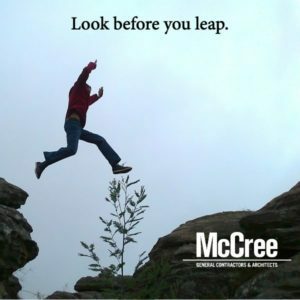 If you’re unsure of what you need or what’s possible, McCree provides advisory services to guide you through what’s best for your vision. When considering a new building, expansion or renovation, a feasibility study is an affordable starting point to assess what’s possible and establish a preliminary budget. This begins with a conversation about your vision and needs and a possible site visit. A McCree Coordinator will meet with you to better understand what you are trying to accomplish and will provide you with a proposal for the feasibility study. The feasibility study will provide you with a regulatory review of the property, a preliminary design, preliminary schedule and a preliminary budget. Each of these will allow you to better understand what is involved in completing your project and how much it should cost. From there, you may make the decision before spending a lot of money and time whether the project is best for your organization. Your McCree Coordinator will guide you step by step through the evaluation of various alternatives and your decision process. Before making an investment, why not be sure that every dollar is used efficiently now and for the long term. Avoid cutting corners today, and you’ll be much happier tomorrow. Let’s talk. We’ll answer your questions, save you time and calm any sense of overwhelm you may be experiencing. Getting your project off to a great start begins today. Facing These Specific Needs? Find answers. Here’s my idea, how do I get it built? What’s a realistic budget for my project? How can I realize the best value bang for my construction buck? Buy, Build, or Lease, Oh My! What savings does true design-build offer me? How can my company brand and culture be reinforced through my building project?